Hey Y'all, OUP here, I'm posting this Update Revision for TX-1911. We have decided to move the DEADLINE to Sept. 13th. Please read the original Instructions and Rules Below and remember that the ONLY thing that has changed is the Entry Deadline Date. Happy Grilling and Smoking Y'all. Our next throwdown is going to be.......drumroll please! A qualifying entry MUST have some sort of aquatic edible (kale doesn't count weirdos!). The aquatic edible MUST be cooked over an open flame (or a flame contained within a grill body - basically, cook it with fire). It does not matter whether it is a freshwater edible, saltwater edible, fish, shrimp, lobster, crab, oyster, seal ( ), shark, crawfish, etc. It must be some sort of meat. To keep it honest, and ensure that the entry was cooked for the throwdown, there MUST be a trident somewhere in the picture. It can be an actual trident. 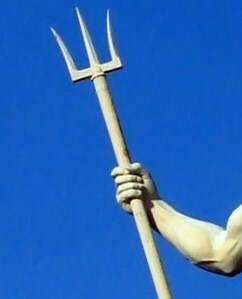 It can be a picture of a trident. It can't be photoshopped in. Since this is our first Aquatic throwdown, no side dishes are allowed on the plate. The intent is to focus on the aquatic edible itself. There may, however, be more than one such aquatic edible on said plate. Please post any questions in this thread so everyone can see the question and the answer. yeah, been here for 2 weeks. sticker shock at brisket prices. The gaunlet has been laid. Y'all don't forget to get an entry in! The last weekend to get your entries in! Lots of opportunity for creativity here! Show me what you got! Hope to get to one of these throw downs some day. But I ain't got a lick of knowledge about smokin' seafood yet. Good Place to Start - - - - you can always stick some shrimps on a stick and grill'em "VOILA"
Better late than never. My entry has been submitted!!! !